After a decade of relatively tranquil seas, the 2017 Atlantic hurricane season was literally one for the books. Long after Hurricane Irma ravaged Puerto Rico, more than half of the country was still without electricity — a true testament to the power of this storm system. Unfortunately, as surface ocean temperatures continue to rise, we can only expect more powerful storms in the future. With this in mind, perhaps this ingenious floating “hurricane-proof” home will allow humanity to better weather the challenges of a more tempestuous planet. Architect Koen Olthuis and housing startup Arkup unveiled plans for a series of “livable yachts” at the Fort Lauderdale International Boat Show shortly after the storm. Olthuis’ architectural firm, Waterstudio, has produced floating structures for the past decade. We’ve covered flood-proof homes in the past, but these floating structures have been designed to handle not only rising waters but also the powerful winds (up to 156 mph) associated with Category 4 hurricanes. In February 2019, the storm-proof homes became a reality. 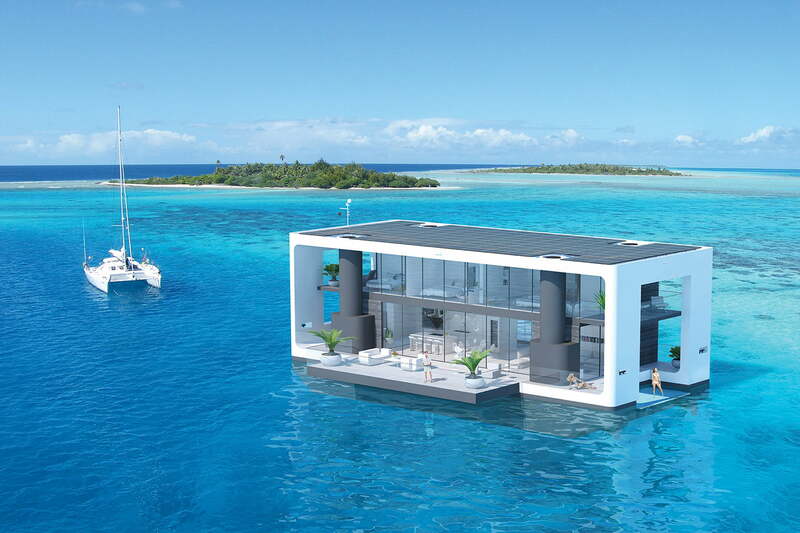 A hydraulic system allows the unit to rise more than 20 feet during a surge, and a series of rooftop solar panels will enable each of these floating homes to operate completely off the power grid. These glorified houseboats will also incorporate a rainwater collection and filtration system, allowing them to fulfill basic plumbing needs in situ. Arkup debuted its first floating residences at a yacht show in Miami in 2019. It’s a fitting location to showcase the structures; Miami is projected to be hit hard by a changing climate, with scientists projecting the city could be at least partially underwater by the year 2100. Arkup’s first homes likely won’t be an option for most, especially with a price tag of up to $6 million. But they are quite impressive structures. Listed at 4,350 square feet, the homes can be customized to however the owner prefers, with up to four bedrooms and four and a half bathrooms. It can be set up on land, anchored by hydraulic studs, or take to the water. With the first model under its belt, Arkup plans to create smaller structures that will be about 1,600 square feet and come with a smaller price tag. Updated on February 27, 2019: Arkup’s first yacht is now available.